With nearly 12,000 students enrolled in 24 schools, Bonneville Joint School District No. 93 (D93) is the fifth largest school district in Idaho. Located in Bingham and Bonneville Counties, D93 employs over 1,600 people, of whom nearly 600 are certificated personnel. D93 has 14 elementary schools, three middle schools, and four high schools, including two comprehensive high schools, an alternative high school and a Magnet school. D93 also offers curriculum online through Bonneville Online. To manage the large student population in the district’s schools, every school year, school secretaries would have to process large amounts of paperwork for each new and returning student. Since parents filled out 11 paper forms per child per year, it took 20-30 minutes per child just to enter the information into the PowerSchool student information system. 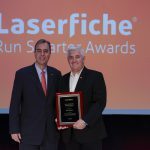 Using Laserfiche Forms and Workflow, the district automated the entire student registration process, reducing the time required to complete the process by 96%—from 30 minutes to just one minute. Now, parents fill out an electronic student registration form and the information is automatically pushed to PowerSchool, saving time for both parents and school district employees. As part of the student registration process, parents or guardians fill out an online New Student Registration form on the school’s website. Parents fill out an electronic student registration form during registration. Based on the parents or guardians’ selections, fields appear dynamically to obtain more information. 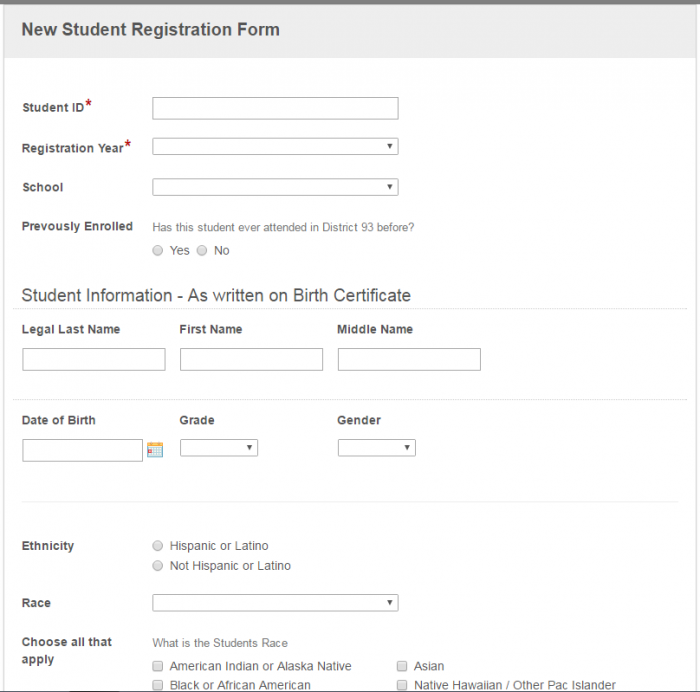 To simplify the routing of the form after it is submitted, the form includes a hidden field that contains the name of the appropriate school secretary. This field is populated using a database lookup based on the name of the school in which the student is being enrolled. Once the form is submitted, it is routed to the secretary specified in the hidden field. The secretary reviews the form to ensure that all information, most importantly the address, is formatted correctly and makes any changes as needed. Once the secretary approves the form, it is saved in the Laserfiche repository, launching the “New Student Registration” workflow. 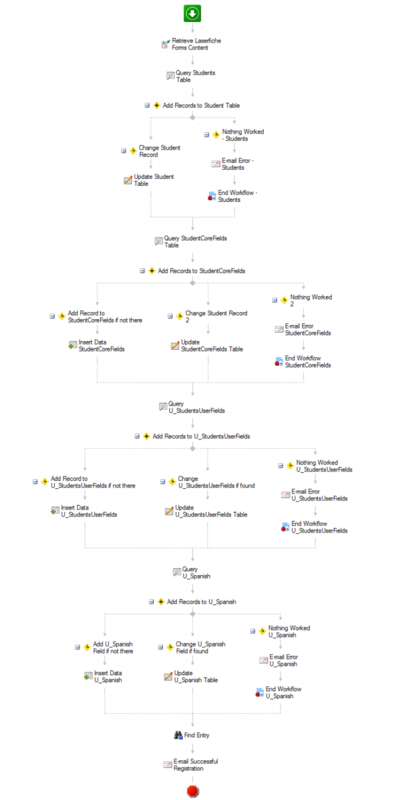 The student registration process is mapped in Laserfiche Forms. When a student is reregistered the following year, the parent simply inputs the student’s ID number into the form, and the rest of the information is populated automatically from the PowerSchool database. The parent can edit any of the information if it has changed from last year before submitting the form. Once the form is approved, Laserfiche Workflow populates the PowerSchool database with information entered in the form. If the student’s record already exists in PowerSchool, information that has changed is updated. If the student is new, a completely new record is created. If the student is a Spanish speaker, the U_Spanish field is also updated. Laserfiche Workflow inserts information from the registration form into the PowerSchool database. Once all the information is updated in PowerSchool, Workflow automatically notifies the secretary of the successful registration by email. The use of electronic forms has reduced the time it takes for a secretary to process a student’s information by 96 percent. The simplified reregistration process saves significant time and increases the accuracy of information. Information in PowerSchool is always up to date. The school district saved money on paper and postage since all forms are now online and hard copies no longer need to be mailed to every student prior to the new year enrollment. Get started with integrating your organization’s various software applications by downloading the free Guide to Easily Integrating Document Management Software.